White Leopard with matching laptop skin is designed specifically for the MacBook/Pro. The sleeve provides your laptop with maximum protection. And, external zippered pocket securely carries other items. 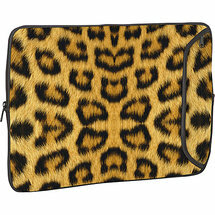 The removable matching skin allows you to express your style whether you laptop is in it’s protective bag or not. Moreover, the Leopard’s pelt look so real you’ll want to pet it! * Zippered external pocket provides secure storage for powercords & more without worry of scratching your laptop! * Sleek design slides easily in and out of your backpack, briefcase or luggage with ease. * Skin can be removed and reused over and over again. * Free matching cell phone skin included!